The scorching heat from summer finally subsided. Before you know it, precipitation will creep into the forecast, creating a blanket of snow. That’s right! Winter is coming with a vengeance. 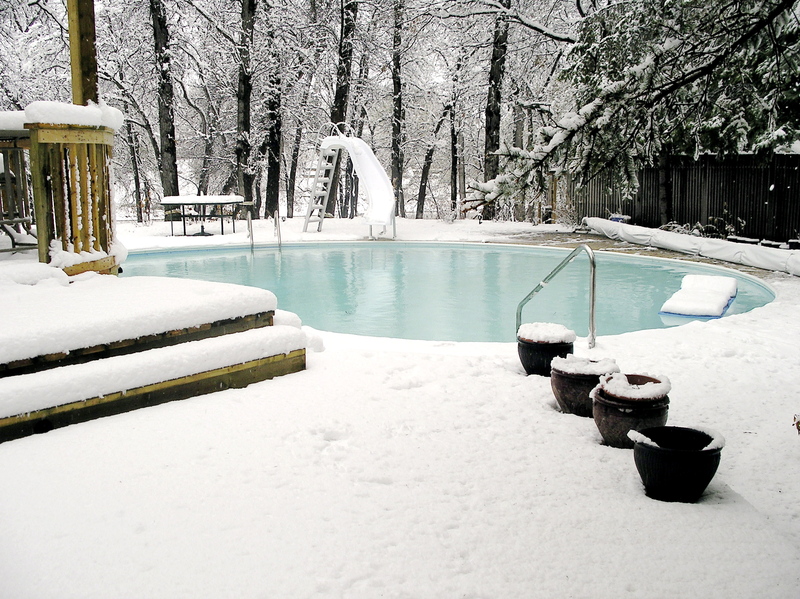 Get out the blankets, start a roaring fire, and get your pool into shape for all of that snow. The experts at Shoreline Pools have all the essential tips for winterizing your pool and keeping it safe from the ice and snow of the season. In the never-ending battle against Mother Nature’s icy wrath, a pool cover acts as a shield and protects your pool from the snowy weather. To make a long story short: your pool may not survive the frost unless you invest in a quality pool cover. You can find many different types of pool covers on the market, but mesh covers, also known as safety covers, come with the highest recommendation. It may look like the pool cover freezes during snowfall, but it actually freezes to the surface of your pool water. Now you have your very own ice skating rink! Just kidding. Do not fear because your pool cover will bounce right back into place once the snow thaws. Avoid interfering with this process because disturbing the ice can result in small tears, effectively ruining your pool cover. Alternatively, you can consider purchasing solid pool covers, which will hold the snow on top of it. But be prepared once warmer weather arrives because the melted snow can cause stress on the pool cover and cause it to break. Pool covers need the support from water in order to remain stable, so never drain your in-ground pool completely. Here’s an expert tip: Put pool salt on top of the pool cover to help melt the snow and ice. Don’t want to clean off all of those pesky crystals? Turn on the cover pump the very next day to remove the residue and melted snow. This trick proves useful for homeowners with a salt water or chlorine pool. But please refrain from using sidewalk salt! This concoction contains nasty additives, which can spell disaster for your pool. Spend the extra dollars and invest in actual pool salt. It’s worth every penny. Keep the pool pump running when the temperature becomes unbearably below freezing. The best way to prepare your pool for the winterization process is to begin early on in autumn. Getting a head start will ensure that you’ve taken all of the proper measures and precautions to protect your pool from winter. Pools become less likely to freeze with dirt, leaves, and gunk on it. Before covering your pool, brush the sides and remove all of the debris that can clog your pool’s filter. Next, drain the backwash line to thoroughly and properly clean the pool filter. 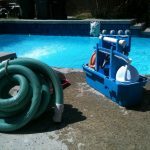 This process will help prevent germs and other filth from entering your pool. Treat and clean your pool water early in autumn, and you will be grateful once summer comes around when you see your pristine pool. You may believe that a pool heater would actually help keep the snow off your pool. Unfortunately, the pool’s heater will complicate the problem by interfering with the natural protection of the pool cover. Plus, keeping the pool heater on all year round will cause your electric and heating bill to skyrocket. The water level during the summer differs from the level during the winter, depending on the type of pool cover you choose. You’ll want to maintain that level throughout the entire off-season, lowering the water level by anywhere from 1-18 inches! You cannot stop the avalanche of winter as it races down this hill, so it’s better to come prepared for the approaching storm. In order to enjoy your pool during the summer, you have to take care of it during the winter. Need more assistance for all your pool maintenance needs? The experts at Shoreline Pools are here to help. Call us today!